I will be away tomorrow. Just to satisfy someone's craving to stay in a hotel. Nyla is clueless. She thinks we are going there for shopping so she's in for a surprise! I also cannot bear to let you ladies wait so here I am working overtime. Happy to do so, really. I must thank my woman, Tina, for conceptualising this photoshoot. I just had to turn up at the studio with the new ponchos. In short, she's just multi-talented. 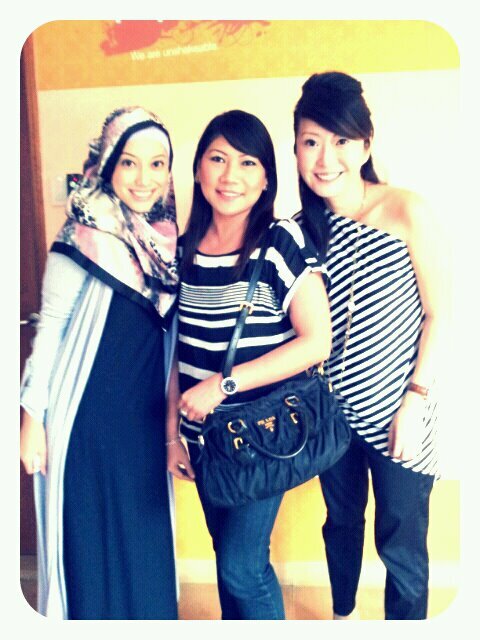 Just a week ago, she came to my place to conduct make-up lessons for my mommy friends. One who is not icky about time, what was supposed to be a 2 hour lesson dragged to 3 and half hours! No extra charge. Extra fun time. 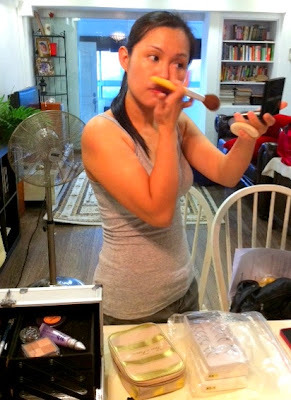 God bless you Tina, the travelling make up tutor! If you and your friends wanna look pretty or learn how to apply make up, just PM her over at Facebook. Then for today's shoot, she brought along 2 beauties who won awards in their respective pageants that Tina choreographed. Sidetrack abit. This one got to thank my bro, Jambi. At that time he was studying at SIM and needed someone to choreograph a pageant. Tina did such a fantastic job with the first one that for subsequent pageants, she was called back. WOOHOO stuff. Extremely proud of her. If you have a blogshop and would like them to model for you, just let me know! 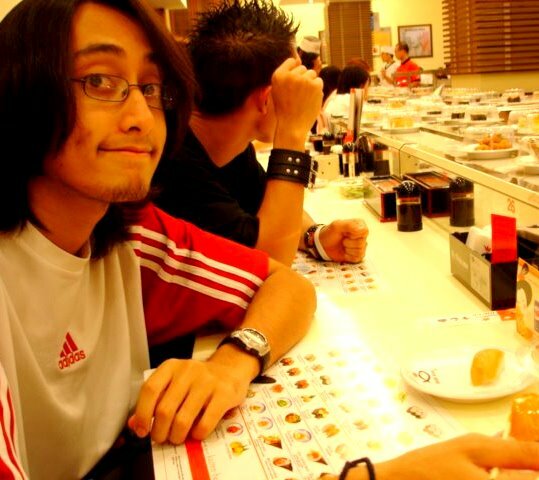 My brudders Azhar and Franco Mendez Sevilleja (search this name on Facebook!) you two are just damn damn awesome. So if you all wanna do any form of shoot out, just add them on Facebook, PM them or something. They are so smiley..so down to earth. And if you very stiff with your poses, they can even guide you. lol! I'm not kidding. They are just super sweet. I consider myself very very blessed to be surrounded with these kind people. Alhamdullilah! Green+White (Kermit) - Don't mind ah..My bogeh influenced by The Muppets. Mustard Yellow+Navy Blue (No Idea) This one tough for her. Pink+Purple (Nyla Bieber) "My fav colour is pink. Justin's is purple. Just put me and Justin la." Beige+Black (Starbucks)- "Like coffee. You just put Starbucks la." Light Pink+Dark Pink (Girls) -"This one all girls sure like. So you put 'Girls'." Yes Maam. As you can see, these excluzif ponchos can be styled in many many ways. Half chiffon, half cotton lycra, free size (FITS S to XL), a piece of this Excluzif Dual-Tone Poncho is $55. I enjoyed this very much I watched twice la. 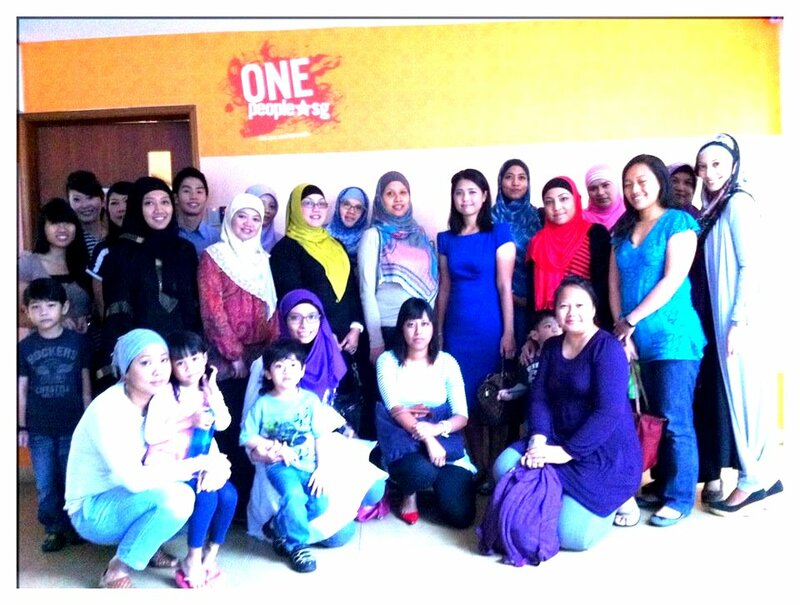 The first time, I watched with E's cousin, Kak Ana and her children. 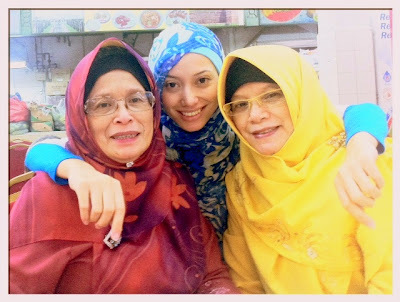 Second time, with my mom, Wak Gayah and Bibik Juma. E was on leave and Nyla pleaded with me not to bring her along so I left Nyla with him. Wak Gayah and my mom actually bought the novel...made sure they read it before watching. It was a nice outing. Funny also. I remember the last time I watched a movie with Wak Gayah was when I was seven, I think...We watched some cartoon dinosaur movie. "The Land before Time." Wak Gayah, her son, Udin...My mom, myself and younger bro, Jambi. At the old Cathay if I am not mistaken. Bibik Juma has never been in a movie theatre before. When it was dark, she held my hand so tight,"Maaaaaammmmmmm, nga pa in sih gelap banget?! Saya takuuuuuutttt sih!" Malas aku nak jawab. I just told her to keep quiet. Lol. Then in the middle of the movie, I overheard my mom and Wak Gayah whisper to one another. People, you heard about Makcik Keropok right? Apparently, there is a new sighting now. When I saw this irresistable enchantress at my corridor walking towards my house, I was super excited can? She was actually my secondary schoolmate back in Yusof Ishak Secondary School. I knew of her existence because she was kinda cool la. Step Gwen Stefani gituk. But we never spoke to each other. She too cool for me la I guess. :p We met again twice during my workshops too last week and few weeks back! So yesterday maciam excited that we will be chit chatting with each other. Like finally. A stay at home mother for 8 years, this lady is reviving the past trend of making business. You know the door-to-door sales? I find this idea extremely fascinating. By the way, would you like to know what is inside her huge basket? The moment she stepped into my house, she asked me if I owned a jubah/abaya? I told her I have one and showed her mine. The moment she saw my abaya, she asked,"You bought this in Indonesia?" "Eh correct! I bought this at Tanjong Pinang." was my reply. This Nurani has got an eye for abayas. One look and she knows whether the abaya you are wearing come from Indonesia....India...etc. So many people wanna turn me into a hijabella. Heeee! I feel so loved! Masyallah! 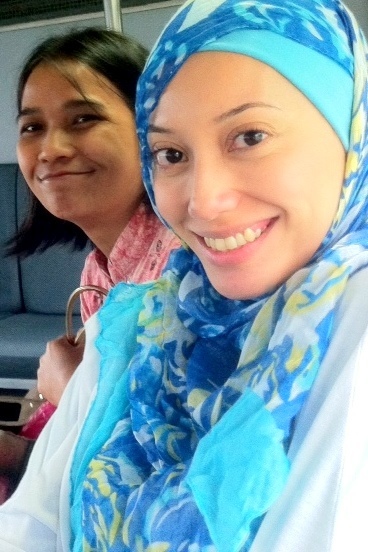 Nurani, thank you for sharing with me your story. What started out as a much needed holiday with her husband turned out to be one that has turned her into a businesswoman. She went to Dubai last September and bought soooooo many abayas for HERSELF. She paid no attention to that but when she returned to Singapore and showed the gorgeous and exclusive pieces to her families and friends, they just grabbed until she had no more pieces for herself. I must show you this cool picture of Nurani and her sisters wearing Aswad Sisters' Abayas during Hari Raya Haji! Her kind and supportive husband then sent her again to Dubai. This time, trip with a mission! So yesterday, Nurani laid out a basketful of abayas for me. The wonderful thing about yesterday was that I shopped in the comfort and privacy of my own home. That plus, I could try on as many pieces as possible! Definitely save us ladies the hassle of "Alamak...Tak muat ah! Cam mane eh?" 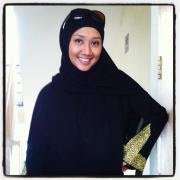 With Nurani and her Abaya basket in your house, easy peasy lemon squeezy...you just select and try on another piece lor! Tried I did many times. Piece after piece. 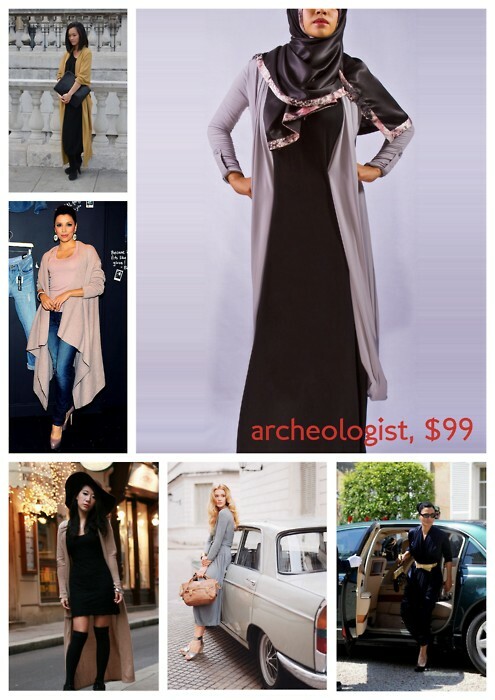 Like Western-style fashion, there are abayas for different occasions. 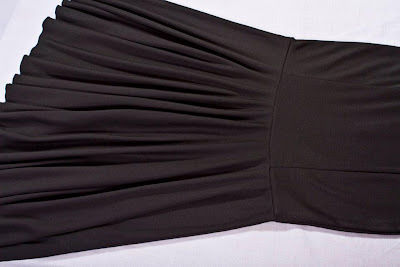 For casual wear, the abayas are usually plain or have simple designs. Can wear with jeans one. I love the flair sleeve! She also has the more elaborate, with intricate designs. I sukaaaaa sangatttt this gorgeous piece. Makes me look soooooo freaking tall!!!! Just something about black. So elegant. Slimming effect...'Talling' effect... heheheh! 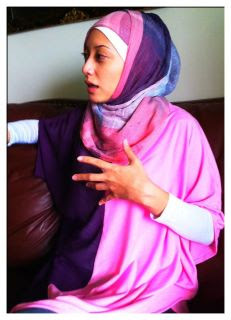 And the material of the Aswad Sisters' abayas is so cooling! Superb quality! Beautiful Abayas will be laid out for us ladies to try, buy, and take home that night. I'm gonna bring my mom! She'll be thrilled since she is an avid Abaya wearer. For those of you who really wanna go but already made plans, fret not. 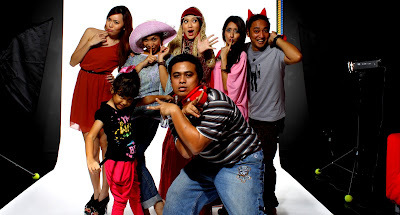 Nurani is like Makcik keropok remember? Heee. The contents in her basket are all very affordable...Ranging from $35 to $120! I assure you that her pricing is not cut throat, in other words, expensive compared to other outlets that sell Abayas. What you can do is YOU host an all girls' party or something and invite Nurani to your party She'll gladly bring her her basket filled with unique Abayas from Dubai, lay them out for you....You and your aunties/sisters/friends/ happily try them on before you buy! What's great is that since your close ones are shopping with you, rest assured honest feedback will be given! "Eh cantiknyeeerrr.." "Eh no la this one too big/small for you.." "Eh this one too simple...Get something more WOW la..."
My ladies, do click 'LIKE' on Aswad Sisters Page and support the newest entrepreneur in town! If you are going this Saturday, I'll see you girls there ya. I was Zayma's Primary 5 form teacher in 2008. First time I saw her, I knew this one was a shining star. Her handwriting was so neat. Her eyes never blinked when I taught. Her ambition at that time was to do well enough to go to secondary school. "Zayma, that goal of yours need to be stretched. Too easy for you." I remembered telling her that. Since she was in the foundation stream, her path she thought would be what most would expect. To Normal Technical Stream...Then ITE...Then Poly. But this girl is too good and I knew that I had to stretch her. I'm glad she was willing to take on more challenging questions during the tuition sessions. PSLE Results Day was a sweet one for her. I continued teaching her even though she is already a secondary school student. Before Zayma arrived, I'd be studying like mad because my brain so rusty liao. I've never met any child so independent in her learning journey. Usually, I'd liase with my tutees' parents but this girl really takes charge of her academics. I've always instilled in my charges that one must always ask if you require new knowledge or when you're in doubt. 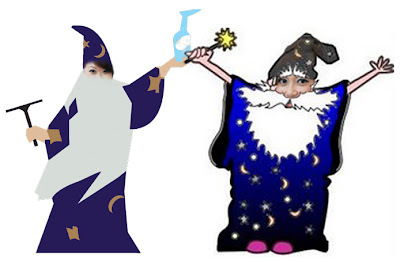 I salute Zayma for having that iniative to always approach me and seek my guidance. A few weeks ago, Zayma SMSed me. Zayma, you have surpassed my expectations and I am very honoured to be your teacher/tutor. Congratulations on your success. Keep soaring! Mr E just left for work. Nyla is sitting opposite me doing a lil bit of writing. Today is gonna be a 'Sharing is caring' entry. Thanks to my previous entry, many of you ladies seemed to have taken a liking to the long cardigan I wore. I love it too by the way! Too too pretty. And Jenn, you are so rocking The Excluzif Ponchoga woman. 2 Sundays ago, (yup THE Sunday I got hijabified), I was checking my email inbox when I stumbled upon a 'read already but have not replied' email by a group of 3 girls who just set up their online fashion boutique named MAIA. Mr E's niece Farha ever shared with me about MAIA since she modelled for them and also the fact that she is a close friend of one of the 3 MAIA bosses. 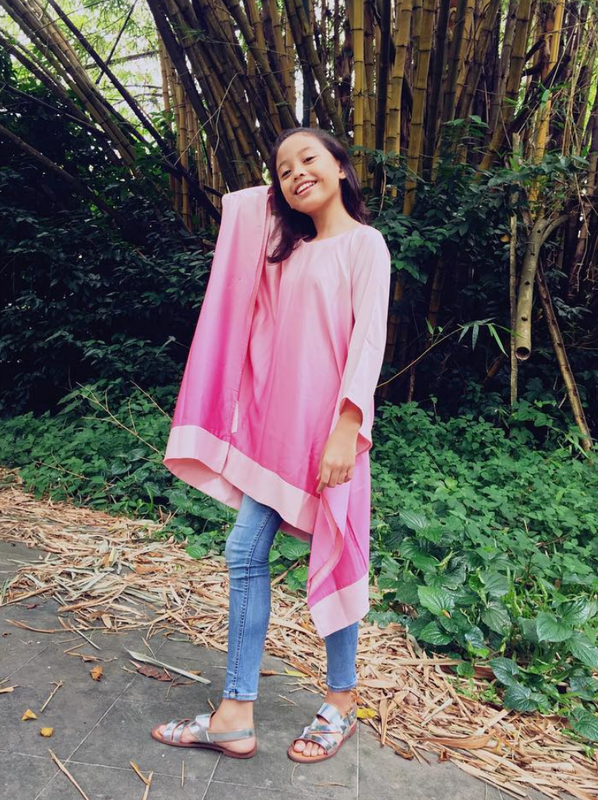 "Aunty Nura, MAIA's clothes are very like ZARA you know. Quality is damn good." 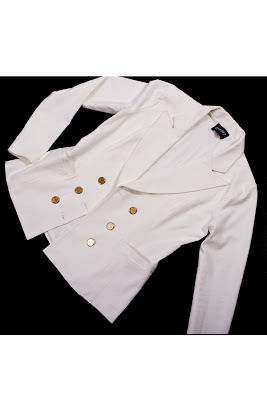 So apa lagi, I went to their website and true enough, I found their pieces to be really classy and unique. I thought I should share with you the girls' story behind MAIA. "In 2010, three girls with a passion for fashion were mulling over a problem. Where they were from, it was hard to find pieces which has great quality, great design and most important of all - unique to their sense of style and personality. They started off by designing one-of-a-kind wedding dresses catered to modern brides and then, got inspired to create feminine yet stylish ready-to-wear pieces. They believe that fashion, like Blair Waldorf, said “… is movement, design and architecture all in one. It shows the world who we are and who we’d like to be…”. Since then, they brought some of their designs to life through MAIA to be shared with everyone who wishes to be decked out in inimitable style and knows how to rock it in whatever they put on! They have put in a tremendous amount of effort to bring to you their designs, inspirations and philosophies… So have a look around, they promise that you will find something(s) that screams out as a must-have for your wardrobe!" MAIA's pieces are all self designed and manufactured. Very impressed with the effort there girls. I have also added to my wardrobe MAIA's Potter Denim pants. Absolutely perfect for casual outings. The girls from MAIA are very sweet too to also include a gorgeous soft tudung in the package which was wrapped beautifully by the way. A short but very meaningful note from MAIA. 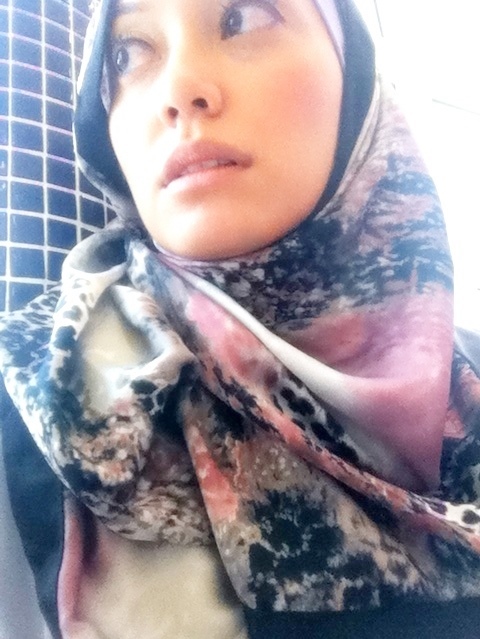 As much as I am getting alot of support, I did have my fair share of criticisms when I started wearing the hijab. "Ah aksyen baik ah tu." "Step turning over a new leaf konon." I have realised that no matter what you do, whether good or bad, if people don't like you, they never will and they will attack you ceaselessly and mercilessly with their words. If previously, I'd flare my nostrils and bombard back, now these attacks mean nothing to me. "Many people are like garbage trucks. They run around full of garbage, full of frustration, full of anger and full of disappointment. As their garbage piles up, they look for a place to dump it. And if you let it, they'll dump it on you. So when someone wants to dump on you, never take it personally. Just smile, wave, wish them well and move on. Believe me, you'll be happier!" "We cannot judge because we do not know what is in his heart" because only our CREATOR knows what is in the heart. "A note to self" for the created yous and me. My MAIA girls, I thank you for the pieces and the words of encouragement. Do also click 'like' on their Facebook page. 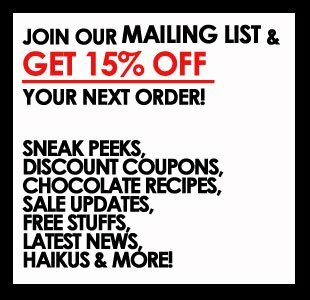 Also, join their mailing list on their website and you all get 15% OFF! "Teaching should be full of ideas instead of stuffed with facts." Today, my partner, Jenn and I did just that during our Maths workshop. 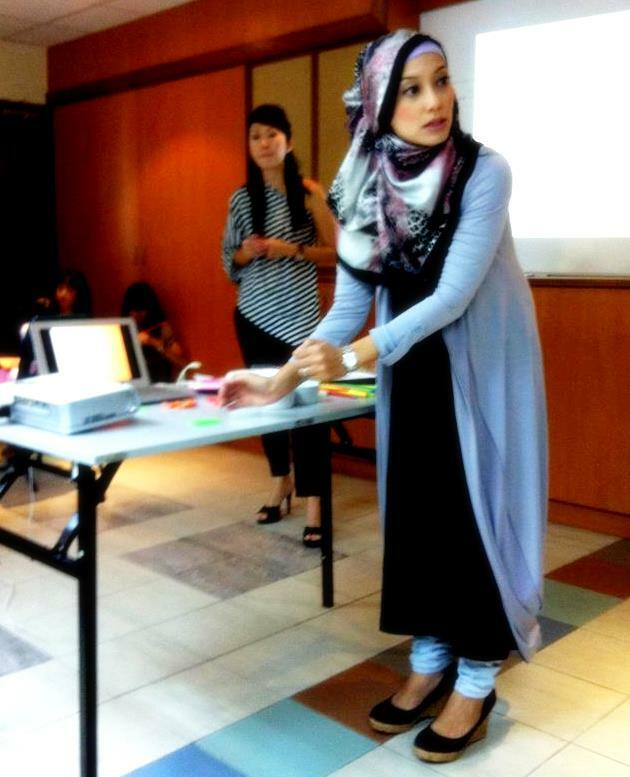 And like our previous workshops, we learnt so much stuff from our lovely participants. How we can use longans...pegs....straws...sweets...cheap toys...stuffed toys to teach Maths at home. Best part, our kids think they are playing but uh uh, they are 'studying' there! I'll share more in the next entry but for now I'd like to express my thanks to two people. First, Mdm Nurani Senari. If it weren't for her message in Facebook, this Maths workshop would have never materialised. "If we have teachers that share Maths learning tips.....Tuition for parents so we know how to teach our kids at home as well." 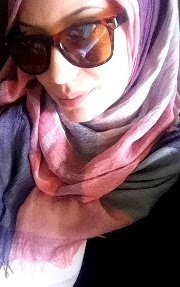 Second person, my beautiful Jenn, who, during our lunch date 2 weeks ago, just exclaimed,"What are you waiting for, Nura? Let's do it NOW!" But Jenn's energy was just way too infectious. Thanks for the push babester. As I'm typing, I (as well as Jenn!) am feeling very happy to have given about 20 adults the knowledge and techniques to allow their children to be stimulated at home. They have an average of say 2 kids? So from today onwards, about 40 children will be unconsciously learning at home and will not be Maths phobic considering they deal with this subject on an every day basis, thanks to their well equipped parents! All praises to the One Above. Alhamdullilah! 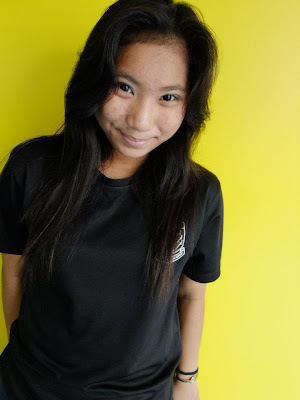 Mdm Lisa, thanks for tagging this picture on Facebook too. So nice to see you again. Mdm Lisa is like a dear friend already to me and Jenn. She has attended our workshop before last year. Okay, time to hit the sack. My nephew is here to spend the night and he is in my room shouting for his Aunty Nura. Yup, my part time work is also that of a babysitter! Not complaining at all. Love my nephew too too much. Good night korangs. Been up since 6 a.m. Absolutely silent and I'm in complete solitude. There is just something very rejuvenating and absolutely peaceful about being alone and having some time for myself. Nyla and I have a movie date with her kindy mates and their mommies later at noon so I'm settling as much work as possible. I'm just happy that Jenn and I are all ready for our Maths workshop tomorrow. Really looking forward to meeting the mommies and daddies! I have been going to my mom's very often this week just to help her out with the latest 'Dual-Tone Ponchos' collection. Yesterday I uploaded a pink + purple poncho (My babe's choice!) on Facebook and Twitter. Nyla + Justin Bieber's favourite colours. If you have not seen it, here it is. Nyla snapped this picture of me while I was chatting with Mom. This girl's good. And here is another one. purple + white combi. Many more colours coming up. I will schedule a photoshoot next week. Last week, my mom also sewed a few random pieces which I have brought home. So, I have with me (as in ready stock) these beauties. My sistas, if you are keen, please email me at nuraesman@gmail.com and I'll email you the pictures ya! One of the most fun and inexpensive types of manipulatives we can use to teach Maths concepts to our children is sweets. I personally feel there is an instant fascination for them to play with (actually, they are learning lor!) sweets. That plus the fact that they are most certainly allowed to eat their Maths manipulatives after the lesson. Hehehe. Now that Nyla is entering Primary 1 next year, it is time we both get serious and consistent every morning for about 1 hour. So last Friday, before she woke up, I had an idea on how to teach the concept of number bonds in a fun way and Nyla totally got it! And like all kids, Nyla enjoys role playing. So here's a video of her 'teaching' me Number Bonds! Don't worry...Nyla didn't eat all the sweets. Hee. Satu je dia ngap. I am now only replying to the emails sent over the weekend. Saturday was spent looking after my nephew, Rooqy, who kept us all busy! By the way ladies, I am very inspired by the top I am wearing. Insyallah, my mother and I will tag team and come up with DUAL-TONE ponchos. Very excited just thinking about it! So do watch this space while we do abit of experimenting with contrasting colours. Yesterday we attended 3 jemputans so the laptop had a very good rest! If you happen to just only stumble upon this blog and would like to know more about the Maths workshop which is absolutely suitable for parents whose kids are 4 to 8 years old, do email me at nuraesman@gmail.com. Fantastic Friday Morning to all of you! Jenn and I are already in full swing preparing for the upcoming Maths workshop on 17 December. We are really excited. We will be closing the registration soon for not only is there a limited seating capacity but Jenn and I also want a small enough number to allow for personalised attention and assistance. I’m a dreamer (so is Nura, I suspect) and Mathematics, a left-brain function primarily concerned with the logical, unromantic pragmatism of life, is at constant war with the right brainers that we both are. In our natural state, it gives us migraines. Causes hormonal imbalance and sudden outbursts that are, contrary to doctor’s (mis)diagnosis, NOT a monthly occurrence. There should be medication for the clinical condition: Mathematiphobia or Mathematoporosis, depending on the severity of one’s condition. To be honest, as a child, I loved Mathematics. On the condition that it gets delivered, once a year, in the form of a modest red packet during Chinese New Year. My Math improved further when my Malay neighbours and friends in school invited me to their house during Hari Raya. For reasons unbeknownst to me then, Mathematoporosis in the guise of a red or green packet wasn’t so bad after all. And that, my friends, is incidental learning and what was to be my first lesson in financial literacy. In what proved to be a shotgun marriage of Mathematics and festivity highlights, I learnt the art (cue right brain music: “ke-ching”) of counting moolah. Ok, not really, but you get the drift. Children these days are way luckier. Parents and teachers are more informed and willing to engage in real world experiences to rouse the textbook sleepy heads from their mid-day siestas in the classrooms. The best Mathematics formula is one that uses the right brain to tune in to the left brain. The best Mathematics lesson takes place in the absence of worksheets. Or at least, momentarily without. Teachers use the CPA approach, which has proven to work wonders in the classroom. The lower primary Math teacher subscribes religiously to the CPA, injecting fun, laughter and buckets of joy into the lesson and everybody emerges from the classroom a beaming Einstein. Ok, that’s in Utopia. Here’s reality. Increasingly, due to the large class size with different cognitive levels and time constraints, many a time, in trying to bridge the cognitive gaps of a class of, say, 30 children, teachers are left bereft of choices but to conduct remediation at the expense of CPA. This is made just a tad more complicated in considering the different learning styles of children. Different strokes for different folks. Is your child a spatial-visual learner, a kinetic learner, a language-oriented learner or a logical learner? If you’re scratching your head, dear parent, I feel you. In the sharing session on the 17th of December, we’ll cover the spectrum of children’s learning styles and the activities you can harness to address these styles, the CPA method, as well as cross-disciplinary learning (Nura and my personal favourite. We share tips on how you can infuse Art/English/Mother tongue lessons at home with Mathematics). The M.O.E.’s curriculum structure functions in the form of a spiral. What this means is in primary one, your child learns the foundation to more complex concepts of THE SAME TOPIC as he/she progresses through the primary, and subsequently, secondary school life. Let’s help our teachers to help our children spiral their way up their learning curve, and in the process, inject a little more fun, meaning and bonding with them. In addition, we will share with you a host of games and strategies you can carry out with your little ones at home to develop concentration, memory, processing speed and visualization skills. These skills do not apply to learning Mathematics per se. They will improve the general learning curve of your child, and since they involve using mathematical symbols and numbers, it makes learning come alive as your child sees Mathematics as a means to an end, and not an end in itself. It’s not about us, really. Neither is it about how noble parents are. It’s about acting in the best interest of our children. So, whether or not we see you on the 17th, dear parents, we hope you’ll continue to coach your children, and help them soar to greater heights. Cheers! Ok mommies and daddies, if you have children aged between 4-8, this Maths Workshop will be very enriching for you. Any enquiries, do email me at nuraesman@gmail.com ya.